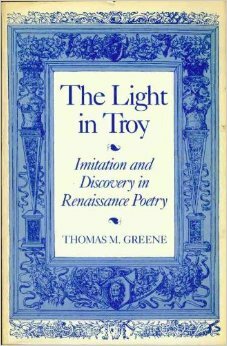 The Committee of Prizes offers the following citation for the award of the Harry Levin Prize (1982) to Thomas M. Greene for his book: The Light in Troy. The practice of creative "imitation" during the Renaissance is the topic of this extraordinarily rich and awesomely learned book. It traces the history of the concept of imitation from Aristotle to Ben Jonson and documents the various forms of its use by the major Itailian, French and English poets. The complexity of its subject matter is here mastered in an exemplary fashion. The study offers detailed, concrete and perceptive assessments of individual writers within a lucid and carefully balanced design, never losing sight of the broad issue of imitation as a decisivie impulse in the perpetual interplay between tradition and innovation, continuity and change. As a work of striking originality as well as formidable yet lively scholarship, Professor Greene's book will become a central, even classic, text for students of Renaissance poetry and of a cardinal topos in the history of criticism and hermeneutics.